The article below was based on statements from James, TehJackal and C3w3. I have since gotten a hold of Adarics (who created EOC.TV with James) from Evil At Work (owners of EOC.TV) and gotten his side of the story. While he admits that mistakes were made, his stance was that Evil At Work at no point stated that the expenses of the event would be paid by Evil At Work, saying that it was intended that ticket sales and donations cover the cost for putting it on. This was communicated in a forum post prior to the event. He continued to say that despite this and when it had become apparent that the event would not be self sufficient, 49b was paid from Evil At Works wallet towards the deficit, along with the 13b that were missing to form the 39b needed to cover player prizes and 10b to Care 4 Kids – essentially clearing out Evil At Works wallet. Evil At Work are a 13-man development team with a multitude of projects for the community, such as EVE Grid, a massive EVE resource with a large number of tools such as corp/alliance management and a new killboard which launches next year, EVE Casino, which is what it sounds like, and Mila, voice recognition software for EVE, among others. Adarics made it clear that all of these projects are for the community and invest money back into the community as well as continually working with charities. “We do not spend hundreds of hours coding these projects, like we have done for EOC.TV, to damage anything. We want to drive awareness to the charities and help anyway we can. Now, with those miscommunication and misunderstandings tearing apart Evil At Work, all of the 13 projects are at risk to turn into wasted time when they were meant to help push the boundaries of education, entertainment and community. All in all, Adarics expressed his hope that the community would understand that the people at Evil At Work are sorry for their mistakes and stated that they did everything in their power to set things right. It seems to me that rather than malicious intent or some kind of scam, this was simply Evil At Works ambition biting off more than it could chew, without the prior knowledge and experience to be able to handle it properly. Currently, Evil At Work as a collective is in talks with EOC.TV creators James, TehJackal and Adarics concerning the event. 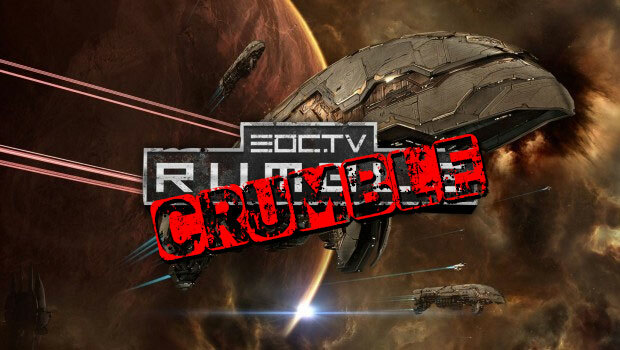 On November 29th, the much anticipated EOC.TV Rumble event was held in the lowsec system of Martoh. Just days before, James and TehJackal of EOC.TV had been on the o7 show, promoting the event, the crowning feature of which was a titan kill. What is unknown to most is that the main sponsors of the event were an organisation called Evil At Work. As key figures in the EVE media found out today, all is not well behind the scenes of this seemingly successful charity event. As usual when these kinds of things go sour, money was involved. According to the organisers, the main sponsor never paid the bill for the titan, a whopping negative 92 billion ISK on the books. James, the original creator of EOC.TV, had been developing and promoting the EVE video site for the past six months, going from an unknown to a well recognised name in the community. James was eventually invited to the development team known as Evil At Work. The organisation is a collaboration of developers with the goal of leveraging several high-profile sites and eventually generating ingame income. EOC.TV was added to Evil At Work’s stable, alongside EVECasino. At this time, TehJackal also got involved in the project, and things seemed to be rolling along nicely. To kick the site off with a bang, the Rumble charity event was planned. It was an elaborate undertaking with lots of moving parts that needed to be managed – and paid for. The charity was intended to benefit Care 4 Kids, Best of Us and PLEX For Good. As the event neared, it became clear that only 250 tickets would be sold, the rest were given away to form the 660 total in order to ensure attendance. However, according to James and TehJackal, another problem reared it’s ugly head at this time. Evil At Work had still not paid for the Leviathan that was the main attraction. At this time, Care 4 Kids creator and manager C4w3, had gotten involved in the project and was in daily talks with James and TehJackal. According to the trio, when it became apparent that no money was incoming from Evil At Work, they elected to pay for the titan using ticket sales and 32b out of C4w3’s own personal pocket. Leviathan pilot General Stargazer (a CZ writer and a corp mate of mine, by the way) received the money needed to acquire the titan literally the day before the event. But that wasn’t all. While the prizes for attending players have been sorted and deposited to Chribba for distribution and Care 4 Kids received 10b from Evil At Work, it looked like the other charities would receive nothing. The whole affair has prompted James and TehJackal to part ways with Evil At Work. Unfortunately for them, EOC.TV is now owned by Evil At Work and the future of the site is highly uncertain. They will be focusing on a new venture named Fleetwarp. Wanting to set affairs in order, James and TehJackal contacted an Eve-Bet representative who will now donate 10b to Best of Us and PLEX For Good, together with General Stargazer, paying out of his own pocket. It is said that all is well that ends well, but clearly, mistakes were made in the management and funding of what was otherwise a successful event which was heavily attended, ticket or no.